There was an unusual breach of Rules at the Turkish Airlines Open in Belek, Turkey last week. 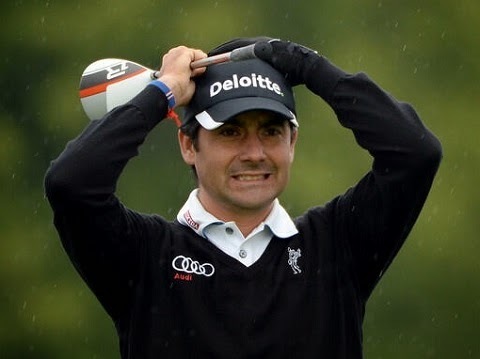 Chilean, Felipe Aguilar, who has won over 30 events in Chile and who celebrated his 40th birthday last week, has been playing on the European Tour since 2006. So, it was surprising that he was unaware that players are not permitted to switch one club for another during a round of golf if they start with a full complement of 14 clubs. To be fair to him there was a mitigating factor, in that his round started on Friday and was suspended because of bad weather, resuming on Saturday morning. Note that he did not have more than 14 clubs in his bag at any one time, but the effect of switching one club for another while play was suspended, was that he had carried 15 different clubs during his stipulated round. Stroke play – Two strokes for each hole at which any breach occurred; maximum penalty per round – Four strokes (two strokes at each of the first two holes at which any breach occurred). Any club or clubs carried or used in breach of Rule 4-3a(iii) or Rule 4-4 must be declared out of play by the player to his opponent in match play or his marker or a fellow-competitor in stroke play immediately upon discovery that a breach has occurred. The player must not use the club or clubs for the remainder of the stipulated round. Ironically, when Aguilar was informed of his breach, he was also told that he was disqualified. It was not until 10 minutes later that this mistaken ruling was corrected and that the penalty incurred was not disqualification, but was a four-shot penalty. The penalty eventually cost Felipe Aguilar 16 places on the final leaderboard, from 48th= to 64th=. Do you realise that you don't need a Kindle to read my eBook, ‘999 Updated Questions on the Rules of Golf”. Simply download one of the free Kindle reading apps that are available for loading the .mobi file to any smartphone, tablet, or eReader. There is a download at this link. I also deliver a .pdf file with the .mobi file, which can be read from any computer and sections can be printed out, as required. in bounds, whether fairway or rough able to be dropped without penalty? This comment obviously applies to the previous week's blog. Presumably, in the circumstances that you describe the player could not retrieve their ball, in which case they could not deem it unplayable. If it is known or virtually certain that the ball was lost in a burrowing animal hole the player is entitled to free relief under Rule 25-1c. As there is doubt as to whether the ball came to rest inside or outside the margin of the bunker the player should take the least favourable option and take their drop inside the bunker within one club-length of the nearest point of relief, not nearer the hole.